Okay, so they missed Christmas 2007 by a few months. The Doctor has never exactly been all that timely, ironically enough. Eidos is getting ready to release the first ever Doctor Who console game later this month over in the UK, and while Doctor Who Top Trumps is just an older card game dressed in Doctor Who trappings, it is still significant enough to at least warrant a look-see, if only for the novelty of seeing that PlayStation 2 logo over the television show's. 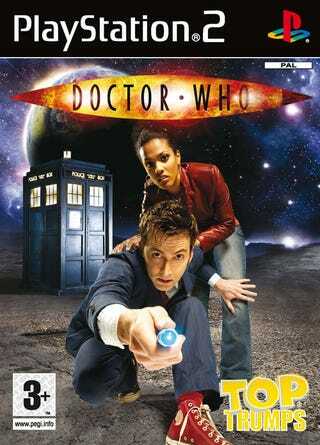 The game is coming out for the PC, PS2, and Nintendo DS, and allows you to play as the Doctor, Martha Jones, fan-favorite Torchwood leader Captain Jack or any number of classic Whovian monsters in adventure mode, two-player head-to-head, or a variety of mini-games. It's licensed drivel really, but sales of this drivel might help determine whether or not we get a real Doctor Who video game somewhere down the line. The game should be in stores on May 16th.